For four decades, Cancio, Nadal, Rivera & Dнaz, P.S.C. has distinguished itself for its unique depth, combining experienced attorneys with young and ambitious associates who understand that success comes with and through the success of the firm’s clients. Recognizing the everchanging legal, economic and technological landscape, Cancio, Nadal, Rivera & Dнaz, P.S.C., has continually evolved by transforming its corporate structure; recruiting well-respected attorneys with degrees and first-hand experience in business and government; creating new legal departments and establishing strategic partnerships with industry leaders and entrepreneurs. TAGLaw recognized as one of the most preeminent legal networks and alliances in the world. 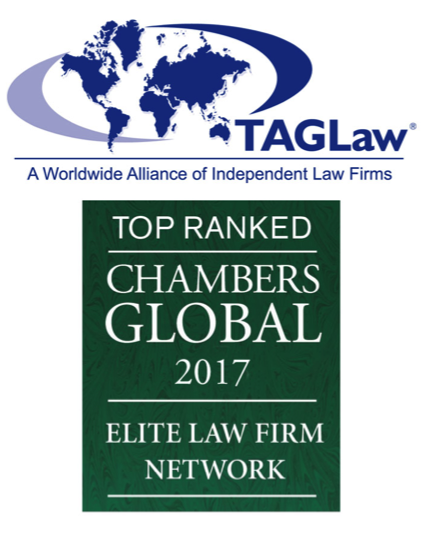 TAGLaw®, the global alliance of more than 160 independent law firms in over 90 countries, was recently recognized by Chambers & Partners as “Elite” for 2017—the highest ranking awarded to legal networks and alliances. This is the fourth time TAGLaw has received the “Elite” designation since Chambers & Partners began ranking legal networks and alliances in 2013. Gbenga Biobaku & Co. (GBC) is a leading Nigerian commercial law firm located in Lagos, the commercial capital of Nigeria, with a representative office in Port Harcourt, the oil and gas nerve centre of the country. The firm has 11 lawyers and is ranked by IFLR and Corporate INTL. The firm provides legal advisory and related services to a diverse portfolio of clients ranging from multinational corporations to local corporate entities, entrepreneurs, government parastatals and non-governmental organizations. 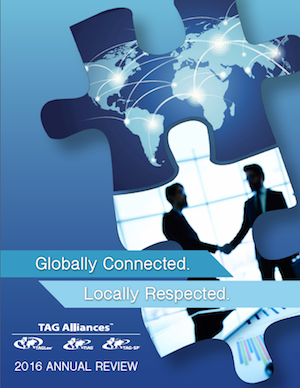 TAG Alliances 2016 Annual Review: "Globally Connected. Locally Respected." We are very excited to share our 2016 Annual Review and our new TAG Alliances slogan with you: “Globally Connected. Locally Respected”. We are very proud of our collective accomplishments in 2016 and the Annual Review reflects the extraordinary collaboration, achievements and successes taking place within the TAG Alliances. We trust the Annual Review provides the acknowledgement you all deserve for your outstanding efforts to maintain our “Elite" status on the global stage. Read the numerous member success stories, check out who submitted the winning slogan and share the document with your clients and contacts. Click here to view the TAG Alliances 2016 Annual Review. Courtenay Coye LLP is one of the top law firms in Belize. The firm’s six lawyers, a large number for the market, enlist more than 70 years of combined experience. The firm frequently advises clients on complex legal transactions and matters and appears on behalf of clients at all levels of courts including the Caribbean Court of Justice, Belize’s highest appellate court. The firm serves a broad range of clients locally and internationally including private individuals, corporations and banks (both state and private).